You are currently browsing the Laurie Klein Art — Laurie's Place blog archives for December, 2010. 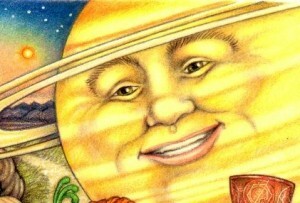 I spent a good portion of 2010 working on a book about the solar system called, “Meet the Planets” (there are a couple blogs about the start up, with more to come). I read everything i could about astronomy and the universe and while i fully expected to find all the scientific connections i was surprised to see how my research touched every other discipline as well: Biology, Chemistry, Math, Philosophy, History, Mythology, Art, Literature, Music, even Pop Culture and Science Fiction. I found such a wealth of information, in fact, i went a little nutty finding ways to squeeze it all into 12 illustrations (it was simply too perfect an opportunity to indulge all my space geek, science nerd, sci fi fan-girl obsessions). The result was a sort of multi-style, collage-type effect and i was so pleased with the look i wanted to duplicate it in my 2010 Christmas card. The fact that Christmas has its roots in the Winter Solstice (space) and the Roman Saturnalia (planet) perfectly brings my year spent in Time and Relative Space to a satisfying conclusion. So, without further preamble (or pre-ramble in my case)… let’s Meet the Holiday! It begins, quite literally, at the dawn of civilization, when Neolithic people celebrated the annual return of the midwinter sun – the Winter Solstice. From the Latin, sol stetit (sun stands still) when the Sun appears to rise and set more or less at the same point on the horizon (thus appearing to stand still in the sky), our agrarian ancestors rejoiced in the renewed promise that planting would begin again. In 3,200 BC ancient Celts constructed what could arguably be called one of the first solar observatories in Newgrange, Ireland, aligning it so that on the day of the Winter Solstice a shaft of light penetrates the passageway and illuminates the rear wall of the chamber. 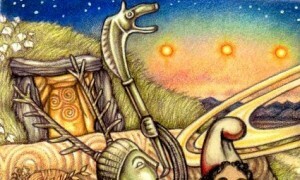 (The image of the sun on the horizon comes from a wonderful time-lapse photo of the Winter Solstice and the Newgrange entrance and carved megalith are depicted as they appeared at the turn of the century. I should also note, while the image at the back of the cave is an actual carving from the interior, in reality it’s on a side wall). Cernunnos, the horned Celtic diety of the natural world, here represents the Neolithic shaman who climbed into ancient oaks or ascended rocky crags and returned with messages from the spirit world bringing promises of the new year. Very much like another annual gift-giver who descends chimneys every year. (Cernunnos, with antlers and torq, is done in the style of an image from the Celtic Gundestrop Cauldron, and blows a carnyx, a Celtic horn). and around the 2nd century AD the Persian sun-god, Mithra, was imported to Rome by legionaries, and his birthday was similarly celebrated well into the 4th century. 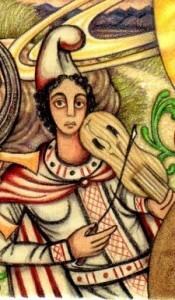 (The image of Mithra is taken from a fragment of fresco, but i took creative license and added the fiddle). Of course, if you really want to talk holiday fun you need to look to the ancient Roman midwinter festival of Saturnalia from which we derive many of our current traditions (see, i told you there was a planet involved). 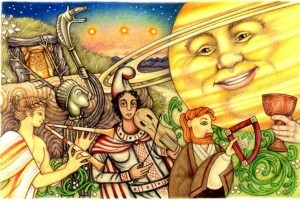 From December 17 to the 24th, Saturn, the god of the harvest, was honored with feasting and merriment. Slaves exchanged places with Masters in the spirit of Misrule, warfare was suspended, homes and places of worship were decorated with greenery, gifts were exchanged, candles lit, and there was much music and revelry (sound familiar). Into this Big Bang of social and cultural activity a new Judeo-Christian religion emerged. As the early Christian Church struggled to become established its leaders understood the powerful hold the midwinter festivals had on pagan worshippers and in the 4th century the Church officially recognized December 25 as the anniversary of the Nativity of Jesus Christ to win converts (NOTE: the actual phrase, Christmas, was first recorded in 1038). Within a century the pagans were won over but while they were willing to follow the new religion they had no intention of giving up their long treasured midwinter festivities. This dual nature of Christmas – pious and pagan – is represented in the style of the Celtic illuminated manuscript, The Book of Kells (ca. 800). 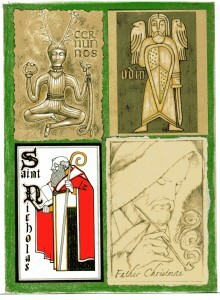 Combing both pre- and post- Christian influences and pagan traditions, sacred text illuminated by ancient motifs, the Celts bring this brief, unofficial history full circle as the bard, Taliesin (both a figure of myth and history), leads Saturnalia revelers: Apollo, Cernunnos, and Mithra from the Newgrange sidh along a path decorated with festive greenery in celebration of the Winter Solstice. But while the card’s story ends here the history of Christmas has another chapter. Those killjoy Puritans attempted to suppress the holiday because of its pagan heritage (even going to far as to declare it a criminal offense to celebrate Christmas in Massachusetts in 1659) and the fact that they weren’t real keen on all that drinking and revelry. You can’t keep a good party down however, and by 1800 Universalists and Unitarians began calling for a public observance of Christmas even tho it was not a biblically sanctioned holiday – they just wanted to celebrated it. About 20 years later the emergence of a family centered hearth & home holiday, visited by a jolly old elf, calmed much of the “misrule” (ie: boozing) aspects of the festival and Christmas – as we know it – was offically here to stay. 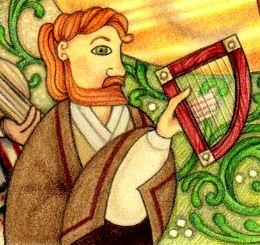 As for any remaining explanatory bits: the Triads (Power of Three) had a special significance to the Celts and is a common motif in their art and literature, thus the three swirls, the three suns, and the three groupings of berries. The greenery is mistletoe, for obvious Christmas-y reasons and because it was a plant held sacred by the Druids – representing the divine spark of creativity. And the design on Saturn’s goblet is a Gallifreyan inscription because i simply couldn’t do a Time and Space history card without some nod to Doctor Who. There has always been a Santa Claus. His story goes back to the beginning of known history when, on Winter Solstice nights, Neolithic shamans climbed into ancient oaks or ascended rocky crags and returned with messages from the spirit world. 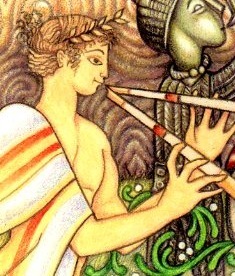 The world’s first gift-giver has gone by many names and incarnations since then ~ these are but a few. FATHER CHRISTMAS (1600 – 1800 AD) – When Protestant reformers sought to do away with “heathen traditions” and ties to the Catholic church St. Nicholas was quietly secularized into Father Christmas. Embraced by cultures throughout the world he has been depicted as a kindly Victorian gentleman, a pioneer peddler, a smith, a knight, a mysterious hermit, and a jolly old elf. Forever young, forever enchanted, with a twinkle in his eye… Yes, Virginia, there is a Santa Claus and however he comes to you, may he bring you joy & laughter. Images & information courtesy of “The Santa Map: A Cultural Geography of the World’s Most Beloved Man”.